Twenty Federation University Australia students have received a grant to travel to India over the next two years as part of the Department of Foreign Affairs and Trade (DFAT) Mobility Grants. The project, led by Dr Harpreet Singh Kandra from the University’s School of Science, Engineering and Information Technology, was granted $55,000 from the Department. This is the first time that Engineering students have travelled to India under a DFAT Mobility Grant. Dr Kandra, a Lecturer of Water Engineering, recently accompanied the first group of seven FedUni students to two collaborative universities in Jaipur and Chandigarh. "This was a fantastic international experience for our FedUni students,” Dr Kandra said. 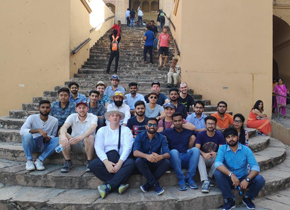 “The trip provided them with an opportunity to experience and learn at the two prestigious universities in India." Dr Kandra said this advanced engineering course on ‘Management of Water Resources’ at Amity University and Chitkara University was a step towards Internationalisation of Curriculum. “The course is designed to help students sit under one roof to learn and share the knowledge and expertise available in the areas of water management,” Dr Singh said. "Site visits, guest lectures and group assessments enhanced knowledge sharing. “The university course we’re studying has brought together the different technologies and approaches from two countries to highlight the good work that has already been done,” Hayden said. Earlier this year, nine students studied a course on Hydraulics and Hydrology with Harpreet Kandra at the Zhejiang University of Technology, Hangzhou, China, again funded by the DFAT New Colombo Plan. “This program is a fantastic opportunity for our students to develop a greater understanding of international challenges and undertake collaborative learning with students studying equivalent topics in our partner universities,” Professor Steve Wilcox, Deputy Dean, School of Science, Engineering and Information Technology, said.